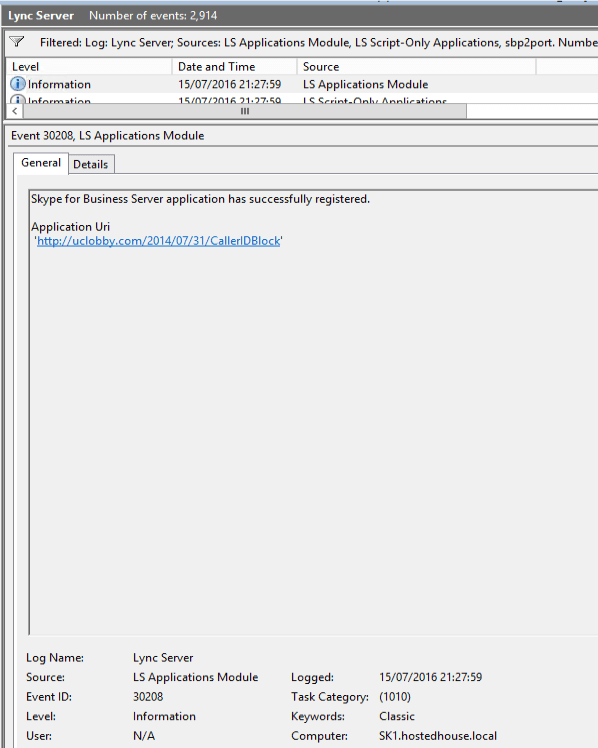 For a long time there has been a little used feature within Lync and Skype for Business that allows end users to highlight a nuisance voice call to the administrators called Malicious Call Trace (MCT). MCT basically allowed the end user to report a call immediately after hanging up which would register in the call detail records database as a trouble call. This information could then be used by Skype for Business administrators to highlight potential issues and act accordingly. Often acting accordingly means not doing much, not because you don’t want to, but because you can’t. Whether that is time or money, they are usually the two main factors. 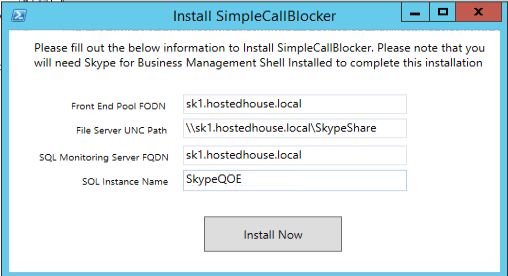 Skype for Business doesn’t provide any administrative blocking options for incoming numbers, instead relies on end users keeping their relationships up to date and/or some third party tool that costs $$. So until now, report a call feature is just a courtesy “hand in the air” announcement from the end user to the admin that they are receiving unwanted calls. It doesn’t actually prevent the caller from calling back. At some point, the end user is going to get frustrated, and force you to take action. This probably will be to assign a new DDI to the user. But this means that some one else may get the problem call, and eventually the caller if persistent will find out the new number and the cycle begins again. This is where you need a call blocking solution. A while back fellow community contributors Chris Norman (VoipNorm) and David Paulino (UC Lobby) made a call blocking script based on Caller ID. This script was based on MSPL scripting used within Lync and Skype for SIP processing. So I thought, wouldn’t it be cool if somehow I can grab the malicious calls from the CDR database and add them to Chris & David’s script so that when a user reports a call, the caller ID is blocked from subsequent calling attempts? Simple Call Blocker leverages the code from UCLobby’s version of the CallerIDBlock tool and ties together information from the CDR database to identify malicious calls and add them to the block list without administrative input. Meaning admins now won’t need to care about problem calls. A user reports a call as malicious, the block list gets updated within a few minutes and bang! no more nuisance calls from that caller for the entire company! I say Simple, because the block is permanent and affects all users. Depending on the uptake I may add more options to this to provide more granularity in the future. The supplied Installation script is recommended to run on a front end server. Please also note that this solution is not stress tested, and therefore suited to small to medium scale deployments. Large deployments, you may want to edit the MSPL script to only process SIP messages from the Mediation Servers to avoid excessive SIP processing time across all modalities. Mr. Vale, your blog provides really great information and actionable tips about Skype for Business! We develop a Skype for Business App called EasyLy (https://grovety.com/blog/story-2-how-and-why-easyly-emerged). We’re very interested in your expert opinion on EasyLy, and any advice you may have regarding its usability and potential value. Could you please get in touch with us? hmmm, been fighting with this tonight a) you need the SQL Mgmt tools installed on the server the script is running on otherwise there’s no connection to the SQL server, that is if you’re dumb enough like me to run this on the frontend, which ever. b) script would run with Default or if the instance was blank, had to modify scheduled task and simply remove -Instance altogether. c) calls from the gateway come in +14165551212@company.com, the only way I can get the block to work is to remove the +1 and the @company.com. I guess it’ll force the admins to review the file in order to take effect. I’m guess that -replace “^sip:(\+?\d*). *$”,’$1′ is suppose to clean things up a bit, any thought to clear out +1 and anything after @. That’s a bit of code there that I do not understand. a) You shouldn’t need the Management Studio to run this, only the SQL Client tools? Testing this module out and all works except for pulling the data from the DB into the text file. I am able to tag malicious calls, have those populate in the DB (checked using the query in the PS). The scheduled task is running. Updated the config to suit non “sip:” data as well. No luck. A bit perplexed!